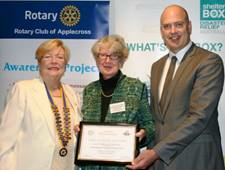 The Rotary Club of Applecross is proud to present awards to individuals and organisations that have provided exceptional service in the local community or local business environment. Recipients of these awards can be volunteers or professionals who take great pride in their work but who don't always receive recognition for their love of humanity, free use of their own time, or their goodwill to others. People in business who have provided a very special service and/or who take pride in their work and are a great role model for others can be recognised for their outstanding business ethics and skills. 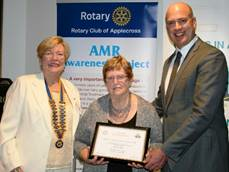 President Lesley Combes, Awardee Peter Herne, and Hon. Dean Nalder, local MP. 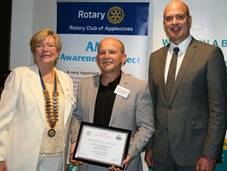 Peter Herne has been a teacher at Applecross Primary School for 19 years and has engaged Rotarians to help explain their vocations to his students. Lesley Combes, Awardee Colin Prior, Quiz Master, and Hon. Dean Nalder. 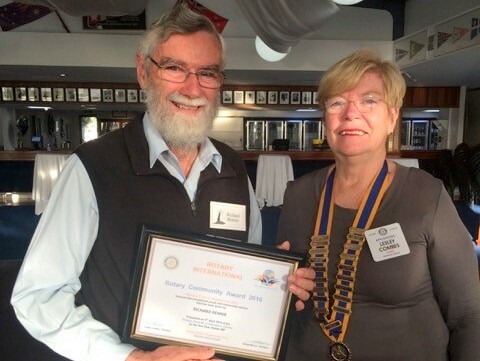 Colin Prior, a retired sub-mariner, was recognised for his skills as a Quiz Master, who helped the Rotary Club of Applecross raise $6500 at a recent quiz night largely for the Bushfire appeal. Awardee Richard Rennie and Lesley Combes. 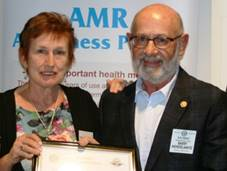 Richard Rennie was recognised for his outstanding support of the Wireless Hill Museum and City of Melville Local History Team. Lesley Combes, Awardee Antonella Segre from Connect Group and Hon. Dean Nalder. Antonella Segre, the CEO of the Connect Group, which is a network and a bridge encompassing people who need help, the relevant support groups and self-help people. Lesley Combes, Catherine O’Neill representing Awardee, Swan Estuary Reserves Action Group, and Hon. Dean Nalder. The Swan Estuary Reserves Action Group contributes an average of about 100 hours each week completing tasks such as weeding, planting and watering and rubbish removal within the City of Melville. Lesley Combes, Awardee Ruth Styles and Hon. Dean Nalder. Ruth Styles has been serving her local community for over 50 years playing piano and organ, including Kids Music Connect, a weekly program for pre-schoolers, their mothers and grandmothers. Margaret and Barry Mendelawitz representing Awardee, Melville Friends of Hatolia. Hatolia is an impoverished area in the mountains on East Timor. The Melville Friends of Hatolia have been assisting and supporting education in East Timor for 10 years. Lesley Combes, Jupiter Salim from Awardee, The Melting Pot, and Hon. Dean Nalder. 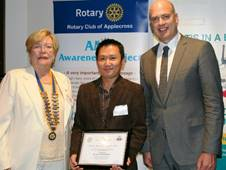 The Melting Pot, an Asian Cuisine restaurant located in Kearns Crescent Applecross, was recognised for offering a great range of Asian Style foods with excellent service. 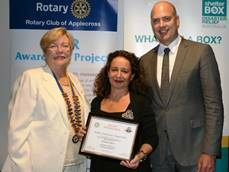 Lesley Combes, Norm Dimanopoulos from Awardee, Lures Fish and Chips and Hon. Dean Nalder. Lures Fish and Chips is a great example of a small, well-run, family business being recognised for providing excellent food and service. 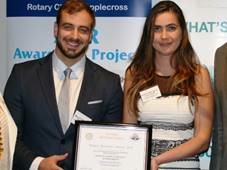 Awardees Marcelo and Andreia Mesquita from Intense Health. Intense Health is owned and managed by Marcelo and Andreia Mesquita, who have shown the way for people to come to Australia to settle, gain skills through further study, earn enough money to start a business, market it and deliver results to happy clients. 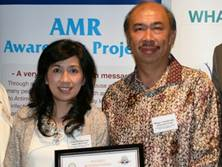 Awardees Mega and Lillies Limadinata from Awardee Jesters of Bull Creek. Jesters provides a level of service that is consistently good and an excellent role model for any retail business that relies on great customer service for success.